150 kVA rated capacity automatic compensated AC voltage stabilizer is 3 phase 4-line, with wide range of permissible input voltage windows (±10% to ±40%) and precise output voltage regulation accuracy (up to ± 1%), providing industrial grade voltage regulation and power protection. 3 phase industrial full automatic compensated voltage stabilizer is 50 kVA capacity, 175V to 265V (phase voltage)/304V to 456V (line voltage) AC input voltage range. The high quality voltage stabilizer is manufactured using the best quality components and progressive technology and is extensively used in various industrial applications. Fully industrial AC automatic voltage stabilizer with 60 kVA rating capacity, 3 phase 4-line and offering input voltage range 175V-265V (phase voltage)/304V-456V (line voltage). As highly compact and virtually maintenance free solutions, they are perfectly suited for industrial and commercial buildings and their associated applications and processes. 100 kVA rated capacity air-cooled AC voltage stabilizer is 3 phase 4-line with 175V-265V (phase voltage)/304V-456V (line voltage) input voltage range, 380V output voltage. This series automatic compensated power voltage stabilizer can keep output voltage stable when outside power supply network fluctuation and load change resulting in voltage waving. Air cooled full automatic compensated voltage stabilizer is 200kVA rated capacity, 3 phase 4-line system, 304V-456V AC input and 380V output, more than 95% high efficiency. It is specially designed to cater the sensitive machines that requires stable and spike-less power for carrying out its functions. 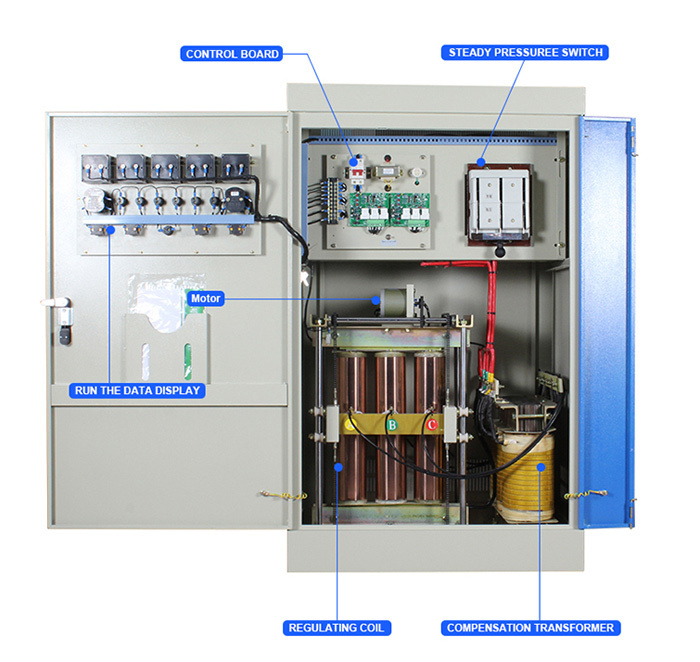 150 kVA 3 phase Industrial AC Automatic Voltage Stabilizer is specifically designed for the needs of the more demanding industrial applications where the need for a more robust and virtually maintenance free solution is required. Fully automatic AC voltage stabilizer is divided into single-phase and three-phase stabilizer and their wiring method is very simple. For single-phase voltage stabilizer, there are two lines at the output, zero line and live line. We just need to connect the zero line and the live line at the input end to the main power supply, the zero line and the fire line at the output end to the required equipment, and then connect the ground line. For three-phase voltage stabilizer, the output voltage is three-phase 380v, three-phase four-wire system, which means that there are three live wires and one neutral wire. We should note that the three-phase voltage stabilizer is phase sequence protected. The phase sequence must not be mistaken when wiring. The input end of the voltage stabilizer is connected to the main power supply, and the output of that connected to the device. Observe whether the input voltage and output voltage of the regulated power supply are stable. If the output is stable and there is no abnormality, then the three-phase voltage stabilizer can be used.